Listened to this poem in a TV show some 5-6 years back, liked it a lot and thought of sharing it with you... I don't remember the name of the poet but a lot of thanks to him for writing such a beautiful piece of art. mushkil hai apna mel priye, ye pyar nahin hai khel priye. dard mazloom janta ka, sunai nahi deta. lahoo ka rang laal ab to kahin, dikhai nahi deta. I joined this company around 2 months back and since then I was very depressed with the wastage of paper here. I saw the wastage of paper while printing documents, while usage of tissues in washrooms by colleagues as well as by house-keeping staff. Though the HR feels proud to put "Save Paper Save Trees" as his email signatures but when implementation comes he might top the list in wasting papers. Wastage of paper indirectly harms trees and in turn harms atmosphere. Seeing the same exercise for about a month, I decided to take a step forward and start encouraging colleagues to stop/lessen the use of paper tissues in washrooms. You can't spread the message verbally to a large audience, so I printed 2 notices for encouraging people to lessen their soft tissues usage and use hand dryers* in washrooms. I asked the house keeping guys to paste this poster in the washrooms at my floors with the purpose of noticing people’s reaction to extend the same in all washrooms across the building. To my surprise, the house-keeping guy was smart, he got the notice photocopied and put those in all the washrooms. It got a mixed reaction, some people appreciate the work and instead suggested using handkerchiefs in pace of hand-dryers but some was there to make fun of it. Some showed their calligraphic talents on the notices and some told me that "Jaante hai ki tum bahut bade samaaj-sevak ho...". As everything needs time to make a sizable effect, it isn't an exception. But believe me that in long term, it will have a positive effect over more people. As an analysis, if there are 10 washrooms in a building and approximately 40 persons use a washroom on an average. 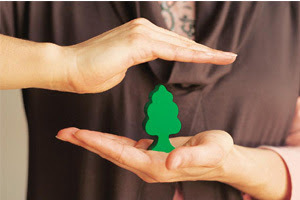 If your notice can take attention of a mere 10%**, 4 persons start contributing in saving trees. Assuming that a person use 5*** tissues daily on an average, then you are saving 10*4*5 = 200 tissues daily. This not only save your operational expenditure but you will also get a positive feeling of saving trees. So guys, what are you waiting for? Use HANDKERCHIEFS and save TREES. * You may argue that hand dryer will use electricity, which is generated using thermal power but that costs much less trees than soft tissues. ** Lately, this figure will grow for sure. *** It is the minimum number of tissues, an average person uses daily. Quentin, he sits next to Will. Veronica sits next to Bill. And Mortimer sits next to Ned. And under Dave, it could be said. And Will and Edgar sit together. PS: Look at your keypad; first letter of each name is the letter on each key. Google is taking the help of TV to promote their new browser - Google Chrome - which has the fourth largest market share after IE, Firefox and Safari. The video was created by Japanese Googlers for YouTube. They came up with a very good ad and you may like that. Below is a video of the same and watching it in full screen mode is a pleasure in itself. आपकी सरकार में कितने मंत्री रिश्वतखोर है? वो बोले, क्या कर लोगे अगर सब के सब चोर है? पूछा, आपकी सम्पत्तीं कितनी है? PS: Above was my first poem, I have written in college time. It was written as a humorous critic on political leaders. This poem should have come on this blog before general election 2009 to act more aptly. Disclaimer: This poem is not targeted at any particular politician but at all politician leaders in general. Any resemblance to real persons, living or dead, is purely coincidental. No, I ain't not talking about any of those exciting IPL matches... Instead, it's related to a board game LUDO. I was playing ludo with bhabhi the other day and trailing :-( And then what happened was just unbelievable, I rolled seven sixes in a row. At that time I felt like Sachin hitting 7 sixes in a row to move India towards an impossible win. Ultimately, it was a close game and I won just by a ONE. 1) At Vaishno Devi, you have to climb up a mountain so that is more tiring and time taking but here is a plane walk. Still, it's not easy coz you are supposed to walk bare feet and these guys made a full concrete road only to increase your pain. My brother got his feet blooded as he did already have some allergy but still he showed great enthusiasm and didn't give up. 2) In Vaishno Devi, you can't find any shop selling articles of personal interest but here, there was a shop at every 20 steps selling ciggis and tobacco. I was surprised when I saw a restaurant on the way with a board "THANDI BEER UPLABHADH HAI". 3) As I have mentioned here, at Vaishno Devi the spirit of devotees for making jaikaras were missing, but here it was on full show. Also you can not find a place in the way where you can't here the sound of Bhajans coming out of shops. 4) Vaishno Devi has been commercialized a lot over past few years. Brands like CCD have already marked their presence there but here it is still missing. 5) At Vaishno Devi, you will hardly find a beggar but here you will certainly loose your count if you start. So these were some differences but the power of bhakti has no comparison anywhere. Overall, I enjoyed here, the walk, the bath at Mansi Ganga, the food, the drive (500 kms in total) and on the top of that the presence of everyone. It's like a double-edged sword, either you can use it as a criticism on current political scenario where parties are making and breaking alliances. Or you can treat is as an sentimental poem targeted at human relationship. bas itni saa.ns baaki hai. क्या ढूंढ रही है ? Line 1: Various incidents of contestants distributing money to attract voters are reported during general election 2009. Line2: Hate speeches, made by many politicians during general election 2009. Line 6: Numerous shoe attacks on political leaders. LIne 7-8: 26/11 Mumbai attacks accused Kasab demanded for chicken and other facilities in Jail. “I want real India, poor people, hungry people”, remember this dialogue from a tourist in ‘MunnaBhai MBBS’? Though it may sound a little harsh, it is the truth about our country. It may be true that we are among world leaders in terms of GDP (gross domestic product), that we are 4th in terms of GMV (Global Manufacturing Value). We may be the 12th largest economy in the world (as per as the World Bank 2007 report) or at fourth position in terms of purchasing power. It might have been predicted that India will be the 2nd largest economy by 2050. We may be the world leader in software services and in many other fields. But hold on, still there is high economic disparity with rich getting richer and poor getting poorer as its per capita income is very low. A large percentage of our population is still below poverty line (25% as per CIA report). Since Bhabhi is not at home, I was at a food stall to get our lunch packed. When a woman with her small kid came and asked for food. Initially, I didn’t notice but when she kept standing there for 15-20 minutes and her kid started looking at people’s plate with hungry eyes, I could not help myself and buy them a rice plate. Very soon, I found myself surrounded by a bunch of these people, everyone asking for food. Clearly, I couldn’t fulfill all the demands, so I ignored them. We were trapped in a similar situation while our Vaishno Devi trip, when Shikha offered her glass of milk to a street kid. What is the reason of this type of situations? Do these guys do anything to avoid such situations or they just do this stuff daily? One reason, I can see, is the population of our country. India shares only 2 % of world’s GDP but we have more than 16 % of the world population. In turn we have a very low per capita income and these situations arrive. Still our government isn’t taking any move to avoid such circumstances. Another reason is ignorance; most of these guys think children as the blessing of the GOD and believe in having as many children as possible. When we were looking for a slum for our community service, I asked one of the residents that how many children he has. I was almost fainted after hearing his answer, the answer was SIX. “Do you think that you are able to take care of them”, I asked, he tossed a grin back in reply. So guys, let’s come together and educate these people of the advantage of a small family. PS: I have also seen many highly educated families, which carry on making babies until a boy arrives.